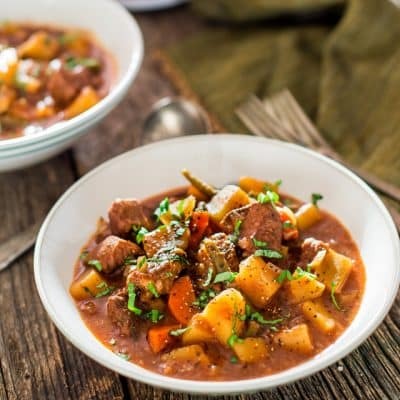 Crockpot Beef Stew – A hearty and savory slow cooker beef stew, perfect for those cold winter nights. This stew is loaded with beef, potatoes, carrots and green beans. I just realized that sometimes I miss giving you guys some of my basic recipes such as this crockpot beef stew. It’s probably because it’s such a staple in my house, I don’t even think about it. In other words, this is a recipe that I’ve actually been making for years and years. I learned it from my mother and the beauty of it is that it really is versatile. If you don’t want beef, use pork or chicken. You can also switch up the veggies, like add some cauliflower or peas. This can also be cooked in a Dutch oven if you want to speed up the time, but the cooking process is basically the same. However, hubs just got me this new crockpot for casseroles which I just love, so of course I had to try it. I can think of so many different types of casseroles to make in it. What I’m really looking forward to making is my cabbage rolls in it. Usually, I only make cabbage rolls twice a year, at Christmas and Easter, so the timing is perfect. But this crockpot is also perfect for stews. What’s not to love about beef stew. Tender, fall-apart chunks of beef loaded with potatoes, carrots and the most flavorful gravy there is. Totally delicious and a true comfort dish. Beef stew is perfect for slow cooking, giving the beef enough time to get super tender and melt in your mouth delicious. There is a bit of work required to get this stew going and basically that means that you need to get the meat browned. You have to dredge the beef through flour then just brown it in a skillet. It’s a very important step. My mom would always always start any type of stew by browning the meat first. It really doesn’t take that long, it’s just something you have to get in the habit of doing. Trust me it will be worth it in the end, you’ll have tons of flavor. Browning the meat is the hardest part of making this. All that’s left to do is dump all the ingredients together in your crockpot and cook away. Usually you can find stewing beef in your grocery store, and it comes already cut into cubes. You want the tough, lean cuts. However, they have collagen which breaks down over long cooking resulting in fork tender meat. Moreover, look for chuck roast, top round, rump roast, chuck shoulder or eye round roast. 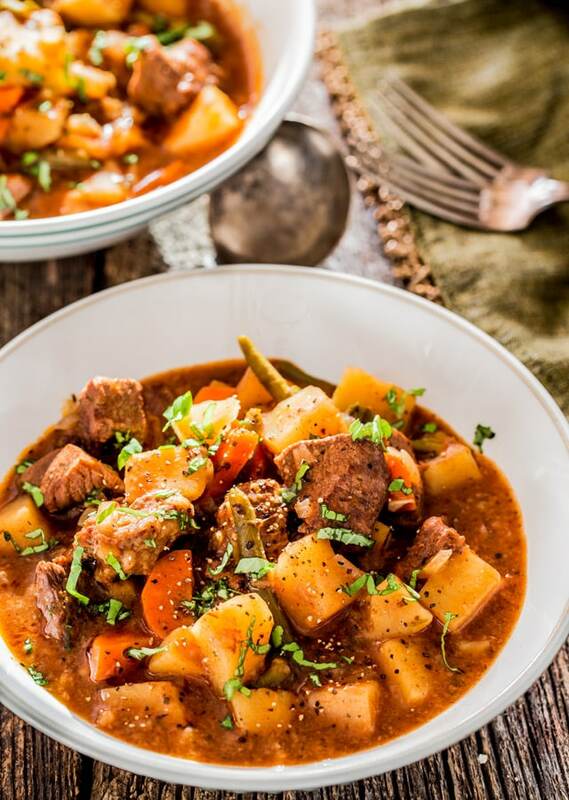 This is a perfect recipe for winter, giving you a comforting beef stew loaded with flavor and providing you with lots of leftovers. 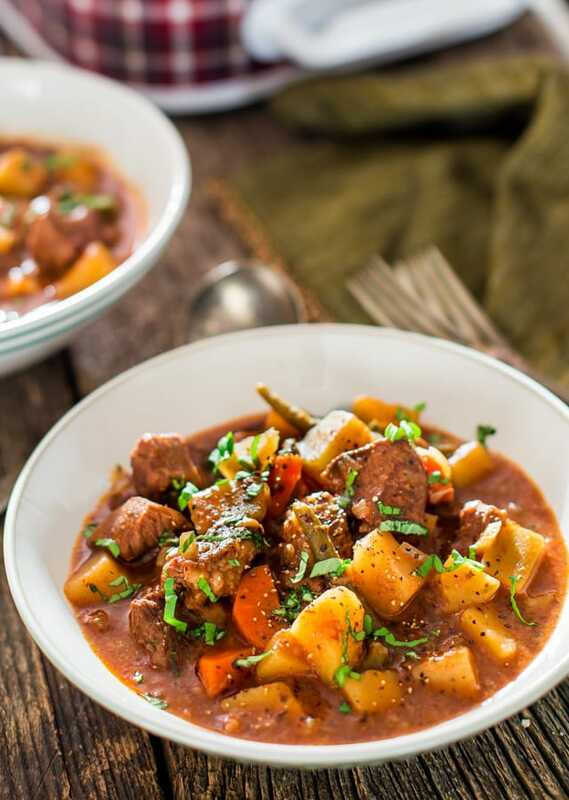 This hearty Crockpot Beef Stew is perfect for those chilly winter nights. This stew is loaded with beef, potatoes, carrots and green beans. Place the beef in a ziploc bag and add the flour over the beef. Close the ziploc bag and shake until each piece of beef is fully covered in flour. Add more flour if needed. Heat the olive oil in a skillet over medium-high heat. Add beef to the skillet and brown on all sides. You will have to do this in a couple batches since you don't want to crowd the meat. Add the broth to the skillet and scrape up all the brown bits with a wooden spoon. Add Worcestershire sauce, tomato paste, salt, pepper, paprika, cumin and oregano to the skillet and stir everything together, bring to a boil and remove from heat. Add the chopped onion, garlic, potatoes, carrots and green beans to your crockpot. Add beef and the broth we made earlier. Stir everything together. Cook on low for 8 to 10 hours or high for 5 to 6 hours. If you prefer your stew a bit thicker, one hour before the stew is finished, take 1/4 cup of flour and whisk it together with some of the sauce from the crockpot, about a cup or so. Then pour this mixture back in the crockpot, stir and let it cook for the remainder of the time. Garnish with freshly chopped parsley before serving. You can use any cut of beef that you prefer, or buy pre-cut stewing beef from the store. You can use pork or chicken if you don't want to use beef. Add any veggies that you like, for example: peas, cauliflower, broccoli, etc. To make this recipe gluten free, toss the beef in 2 tbsp of corn starch. Make a slurry out of another 2 tbsp of cornstarch and a splash of water, and cook until the cause thickens if you'd like the stew to have a thicker consistency. Loved this. Didn’t have smoked paprika but used regular. Very flavourful stew. Floured and browned my meat first. Cooked 6 hours but that was too long for my taste. Thank you Jo! This recipe is spot on. I used bison meat and it was definitely my best stew yet. The smoked paprika was a nice addition to the stew. I give this 10/10!!! Not a type, I usually love a lot of smoked paprika so a tbsp isn’t that much for me. If you don’t like smoked paprika because it’s overpowering, you could use less or just use sweet paprika. can i make with on the stovetop? Absolutely, you’ll just have to make sure you cook the beef long enough, so that it’s tender. Hi there! I made this yesterday, and let it cook on low for 10 hrs. My only complaint, and it’s not really a complaint, is the cubed potatoes were quite hard. I didn’t serve for dinner last night(as I like my stews and chili betterthe next day…) but would like to tonight. Would you have a recommendation as to how I might get the potatoes to soften up??? Thank you in adavance. That’s strange, potatoes should have cooked after all that time. However, they will continue to soak up liquid overnight, so by the time you eat they should fork tender. Otherwise, I would just recommend either cooking them longer, or perhaps you can parboil them first for a bit then add them to the slow cooker. A bit disappointed with this dish. Looked great but the flavour was fairly bland for us. We like more bold flavours. However, my parents really enjoyed it. Always enjoy trying new recipes whichever way they turn out! Thanks. Hi Jo love your blog:) can I skip the Worcestershire sauce? Sure, you could use a bit of soy sauce instead. 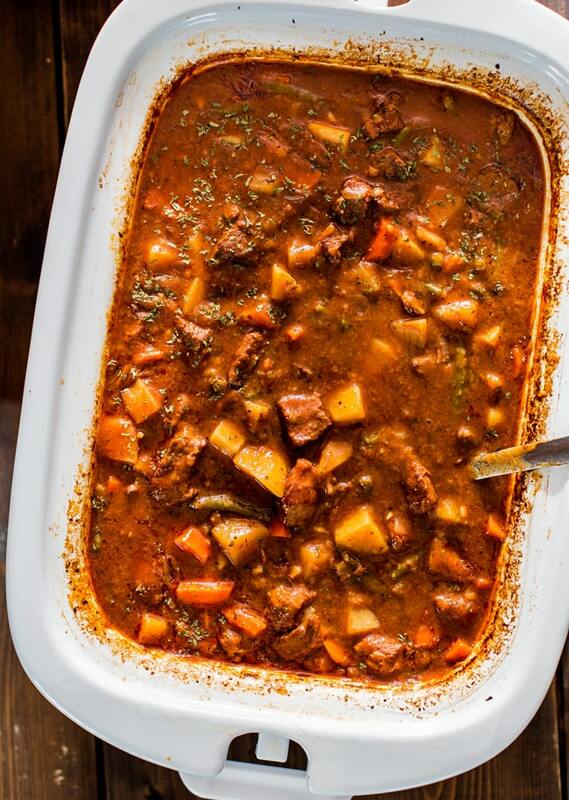 Your recipe for ginger beef stew looks amazing! I will be sure to try it. Thanks for sharing! Just be sure you have all the ingredients measure and ready o go. I made a huge mistake and used 2 cans of tomato paste instead of 2 Tbs. Will let you know how ir turns out. It took me longer Germany to assemble everything than I thought it would cause I didn’t follow my own advice!!! Keeping my fingers crossed everything comes out alrjght. Oh I hope so Elizabeth! 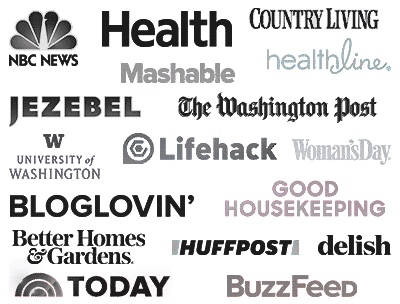 Hi Jo, would I get the same result if I use a regular crockpot/slow cooker? Jo, we just finished this for Sunday dinner, mmm mmm good? Very hearty & filling. Will make this again!! So glad you liked it Maralee! I can’t wait to try this! I just bought the new casserole Crock-Pot and I’ve been looking for more things to make in it. 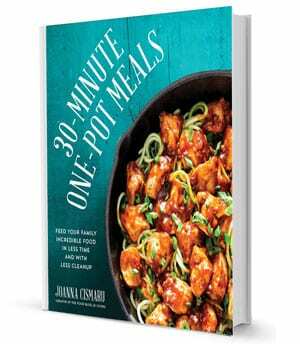 I’ll make this over the weekend. This looks great! Do you think it could be made with chicken instead of beef? We don’t eat beef very often and I’m always looking for new chicken recipes that will appeal to my husband. Absolutely, I do make this with chicken quite a lot too. Pork also, up to you. Wow, this looks amazing! I will have to try this for sure. Oh that looks and sounds so yummy!! Hi Roxana! Nothing beats a good easy crockpot meal!